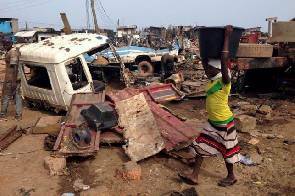 Bulldozers razed hundreds of homes and businesses in the poor Sodom and Gomorrah neighborhood of Ghana's capital on Saturday so the authorities can start widening a lagoon to prevent a repeat of this month's deadly floods. Some residents said security forces sprayed them with tear gas after they threw stones to protect their livelihoods from the bulldozers. By evening, thousands were stranded in the rain amid rubble and household goods strewn for more than a mile. "What they have done is not good for us because this is where some of us work and take care of our families," said scrap metal merchant Muhammed Abdul Karim as he surveyed the wreckage of his shack and the motorized tricycle he uses to haul iron. Flood control has become an urgent problem for President John Mahama's government since more than 50 people drowned in torrents caused by blocked drains on June 3-4, a tragedy that exposed the country's creaking infrastructure. The same night 96 people sheltering from the floods at a downtown gas station died when it exploded in the worst disaster in decades in the West African country. The incidents add to the difficulties facing President Mahama 18 months before the government faces voters in what is likely to be a tight election in one of Africa's more stable democracies. The government has vowed to end crippling power blackouts this year. It started a program with the International Monetary Fund in April to restore fiscal stability and rapid growth to an economy powered by oil, cocoa and gold exports. City authorities said they were destroying dwellings within 100 meters of the Korle lagoon that borders Sodom and Gomorrah in a preparatory step towards dredging and widening a channel clogged with the capital's refuse. "People have gotten fresh sawdust to fill the lagoon to the extent that they are now putting up concrete structures, not even wooden structures. 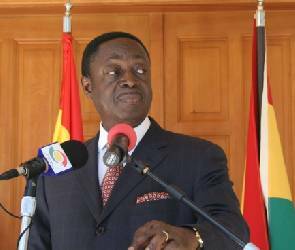 We have to de-silt this river," Accra Regional Minister Joshua Afotey-Agbo told Reuters. Mahama told reporters last week the government respected the rights of people living in the neighborhood, which is part of Agbogbloshie suburb, and would move them gradually, first relocating the local market to higher ground. The government's action carries a political risk. 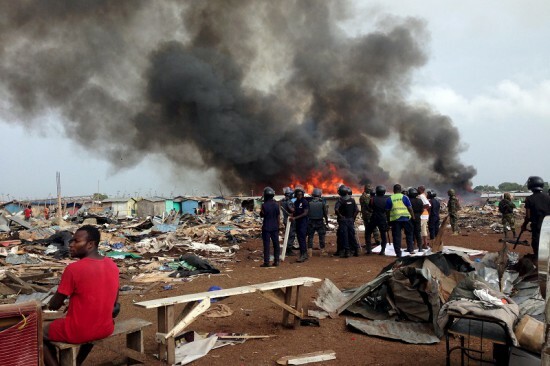 Many locals are from northern Ghana and have supported the ruling party, but some residents burned their homes in protest at the destruction, starting a blaze that raged out of control. "Tell Mahama we are not voting for him again," several residents told Reuters.